We are eating at the market in Oaxaca at a shared table with locals. 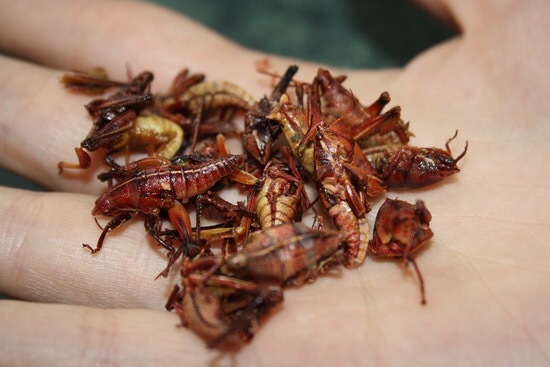 We had noticed earlier that day that many vendors sell Chapolines, which are spicy roasted grasshoppers. The man next to Paula had just bought a bag from one of the many roaming vendors. Paula all of sudden asks him if they are bueno. “Si,” he replies, and tips the bag towards her and pours out a few in front of her. The entire table stops to watch as Paula’s face, upon realizing her predicament, turns several shades of red. It has little effect as everyone watches, expectantly. “I will if you will, ” I say.